~ ~ Tombstone AZ has for many years claimed an 1880s saloon named the "Bucket of Blood." It's said to have been at the Southeast corner of 5th & Allen Streets. Where the Longhorn Restaurant is now located. ~ ~ It's difficult to locate corroborating evidence to support this claim. Everyone repeats nearly the same lines, with no accompanying support. Including the local Tombstone Restoration Commission. 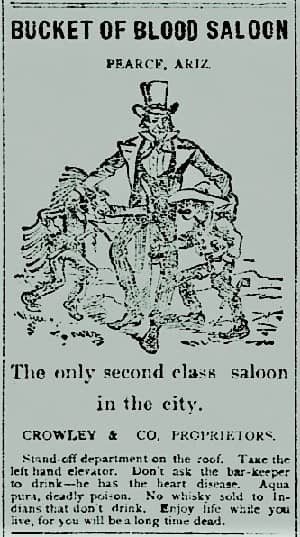 There were other Bucket of Blood Saloons in AZ, though. ~ ~ We'll continue to look for the Tombstone documentation. But meanwhile we'll show you what information circulates about all the Bucket of Blood Saloons. 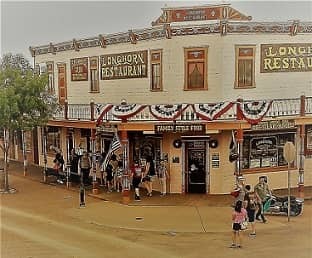 ~ ~ "On December 28th of 1881.... Virgil Earp was ambushed [by] assassins hidden in a new building under construction.... Virgil was severely wounded.... but lost the use of his left arm.... Later it [the building] became a popular saloon called the Bucket of Blood. In 1909 it was remodeled into a tourist hotel. In 1928 it became the Owl Cafe and Tourist Hotel. The historic building burned in a fire in 1942.... A new building was erected in the 1950's and in the 1970's it became the Longhorn Restaurant." ~ ~ Above quoted summary from the Tombstone Restoration Commission on the Historical Marker Project website. ~ ~ The Southernarizonaguide.com website on their Tombstone Restaurants page has similar info about SE 5th & Allen. "The first building here housed the Meyer's Bros. Clothing Co. Later, it became the Bucket of Blood Saloon. Then in 1909, it was remodeled and became the Owl Cafe & Tourist Hotel. That incarnation burned down in 1942. The present-day building was erected in the 1950's and became the Longhorn Restaurant in the '70's. ~ ~ Yet in the 1880s, a nearby town did have a Bucket of Blood Saloon. Documentation for that exists, even in local Tombstone newspapers! While mention of the Tombstone saloon is hard to come by! ~ ~ Pearce is now known more as a mining ghost town, although there are some residents in the area. It was booming the decade after Tombstone. And it indeed had a "Bucket of Blood" saloon, opened by Al King. ~ ~ Kingman also had a Bucket of Blood Saloon! 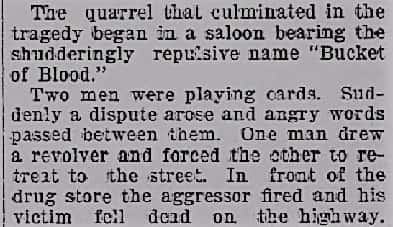 It had some notoriety throughout Arizona, when a killing occurred there in 1898. ~ ~ That incident made the newspapers in Phoenix, Tucson, Flagstaff & Globe. It was ruled justifiable homicide by the coroner's jury. ~ ~ The shooter was defending his brother in a life or death situation. The man killed was from Illinois. 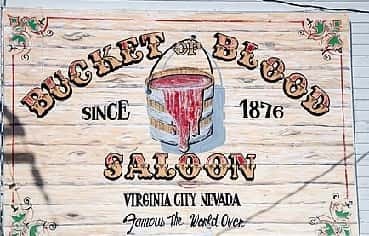 ~ ~ The "Original" Bucket of Blood Saloon is claimed by that in Virginia City, Nevada. Still there today, since 1876, they're located at 1 So. C St. They've certainly renovated over the years. ~ ~ So as the story in Tombstone goes - we have the historic Southeast corner of 5th & Allen. It's now the Longhorn Restaurant. What happened in its past? ~ ~ Virgil Earp was hit by gunfire that came from the 2nd floor of this building. Verified in the Epitaph of 12/29/1881, Tasker & Pridham's store (grocery) was on that corner that day. They said the construction above was the rebuilding of the Old Palace Saloon. ~ ~ According to accounts already named, later in the 1880s that corner held Meyer's Bros. Clothing Co. Varied accounts name it as having been the Bucket of Blood Saloon at some time either earlier or later. Then, most well-known, in the 1920s & verifiable by photographs - it became the Owl Cafe & Hotel. ~ ~ On May 28, 1942 Joe Hood was the building's owner. The Owl's Tourist Hotel had 20 rooms, mostly rented to Fort Huachuca employees. Fire consumed it that day. Along with the attached cafe, bowling alley, Greyhound bus office & rear owner's apt. ~ ~ And so the story goes - a new building went up in the 50s, with the Longhorn Restaurant there in the 70s. 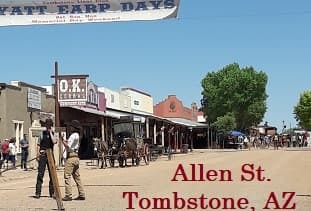 ~ ~ There are often historical events that make one want to know what were the true facts for people who roamed Tombstone & places in the Old West. We like to try to find the accurate facts. ~ ~ Wyatt Earp Day was the big event this month. Held on May 25 to the 27th - to include Memorial Day. ~ ~ We actually weren't in town for the event. But here is a memory from the past! Wyatt Earp Days - Have You Been? ~ ~ 1ST - Nothing New This Month! Sorry, that we have nothing to bring you this month. The reason why? Well, we were on vacation all last month. That's why we missed out on Wyatt Earp Days & any other last minute happenings. ~ ~ We'll probably tell you a little more about our vacation next month. If anything relates, which a few things might! But not enough time right now, before getting this Tombstone Tips newsletter out. ~ ~ So wishing you all the best, until next month! !